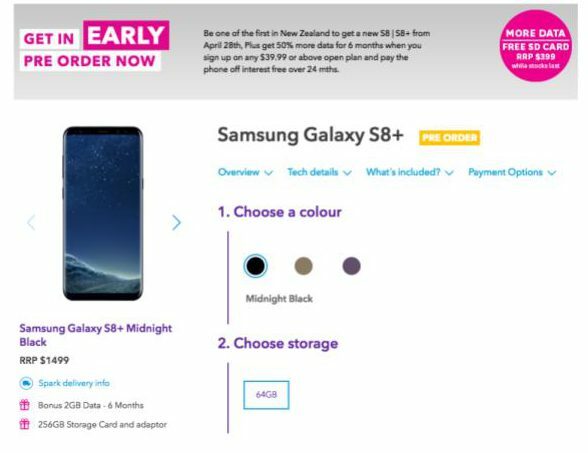 Now is the time to act if you want to become one of the first owners of a Samsung Galaxy S8 or S8 Plus phone in New Zealand. Samsung’s online store, main telcos and select retailers now take pre-orders. Shipping starts from April 28th. The new Samsung Galaxy S8 phone has received raving reviews. There’s, therefore, tremendous interest and excitement among Kiwis to purchase Samsung’s latest flagship phone. Where can I pre-order the S8? The recommended retail price (RRP) for Galaxy S8 with 64 GB storage is set to $1,299 and the Samsung Galaxy S8+ to $1,499. The three telcos in NZ offer various extras in order to entice users. For example, Spark offers 50% extra data the first six months and a free 256 GB SD card. In addition, services like LightBox and Spotify Premium are included in the different plans that Spark sells. Vodafone also teases shoppers with a free 256 GB storage card and access to the entertainment platform NEON for TV and movies on demand. Major retailers like Harvey Norman, Noel Leeming and JB Hifi also take pre-orders. The news site Stuff even sells the S8 on its pop-up store. Furthermore, parallel imported S8 phones from retailers like BecexTech and Buy Mobile are already listed on PriceMe.